Time again for a really sound, fresh and delightfully delicious frozen yoghurt! And believe me – prunes turn out to be just the perfect flavour! Luckily, this frozen yoghurt is also relatively ‘guilt-free’. Aside from the sweetness brought by the succulent prunes, there is so little extra sugar added in this recipe that I was wondering if it really would work out. Several batches later, however, I can safely confirm that it does work out – brilliantly! 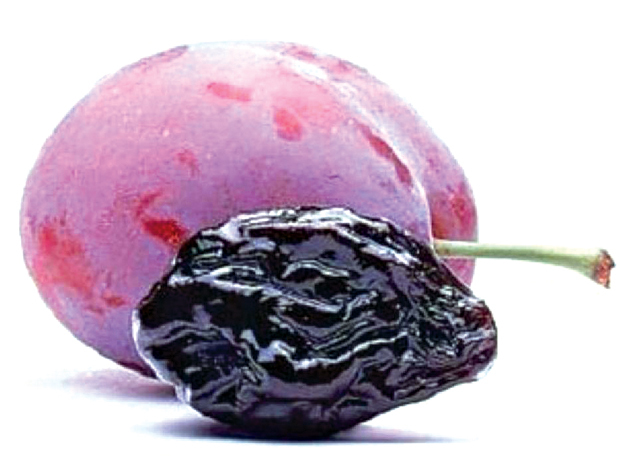 It seems that prunes these days often are marketed as ‘dried plums’ (at least in the US). Technically correct, but why this terminology-change? Purportedly, too many people dismissively tend to associate ‘prunes’ with laxatives. Prunes certainly are well-known for their mild laxative effect, but they are very versatile and have so much more to offer than an end to constipation. Apart from being quite healthy also in other regards (high in antioxidants and dietary fibre, and possibly also good for improving bone density), prunes taste deliciously! And the best ones are said to come from the French ‘capital of Prunes’ – Agen! 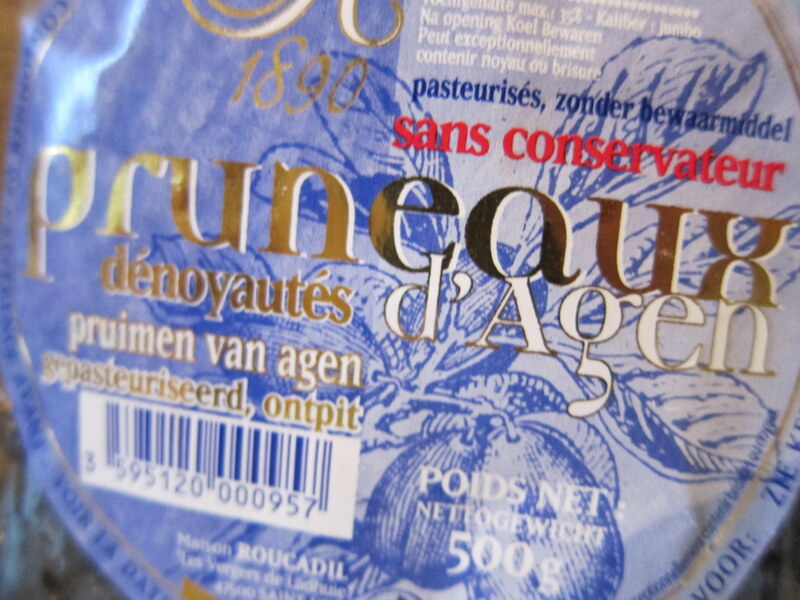 While some prunes come dried up almost as hard as raisins, les Pruneaux d’Agen tend to be moist, soft and succulent. But do not worry if Agen prunes turn out to be hard to find – luckily, the recipe works well with any prunes, even stiff and hard-dried ones. When making frozen yoghurt, I do have my favourites (like my raspberry recipe). 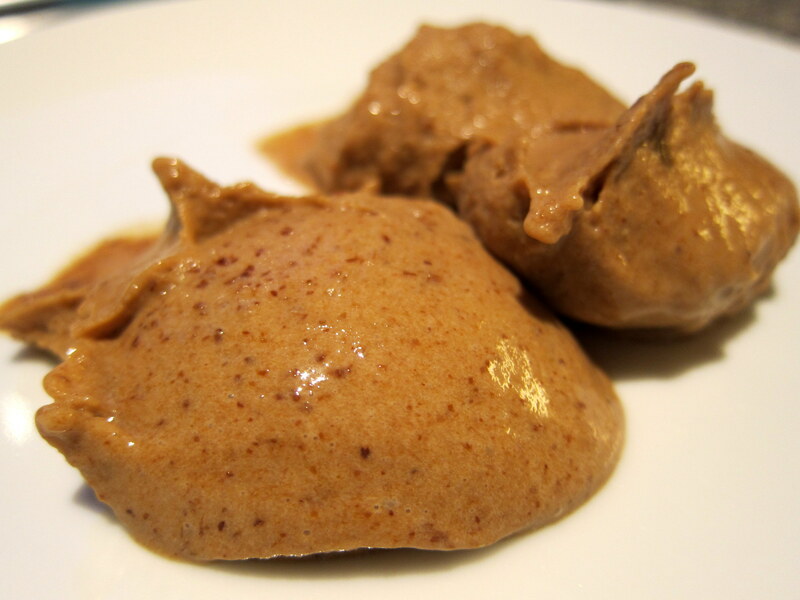 But a few weeks ago, I read a recipe for Italian prune ice cream by Marzella Hazan. While that recipe was for ice cream and contained quite a lot of cream, it tempted me to explore if the basic principles could be applied to make a frozen yoghurt. The inspirational recipe contained very little added sugar, and with the cream largely replaced by yoghurt, the fat content would also be quite low. My guess was that reducing the cream probably would enhance the prune flavour, since cream has this tendency to soften/dampen flavour sensations. But what about the structure of the frozen yoghurt? And the very small amount of added sugar? Would it all turn out just too tangy? Or freeze rock-hard solid? Extremely simple, the base is composed of a little cream and about twice that amount yoghurt. If you want to enhance the tangy, overall yoghurt flavour, you could even add some more yoghurt to the base (and consequently, in case you want a creamier, even softer flavour, you could of course increase the amount of cream instead). In order to maximise the ‘structural aspects’ that build up and stabilise frozen desserts, I also whipped the cream (i e incorporating some more air into it) before blending in the yoghurt. And for yoghurt, I used ‘normal’ whole yoghurt. The base is flavoured with a very simple-to-make prune purée. 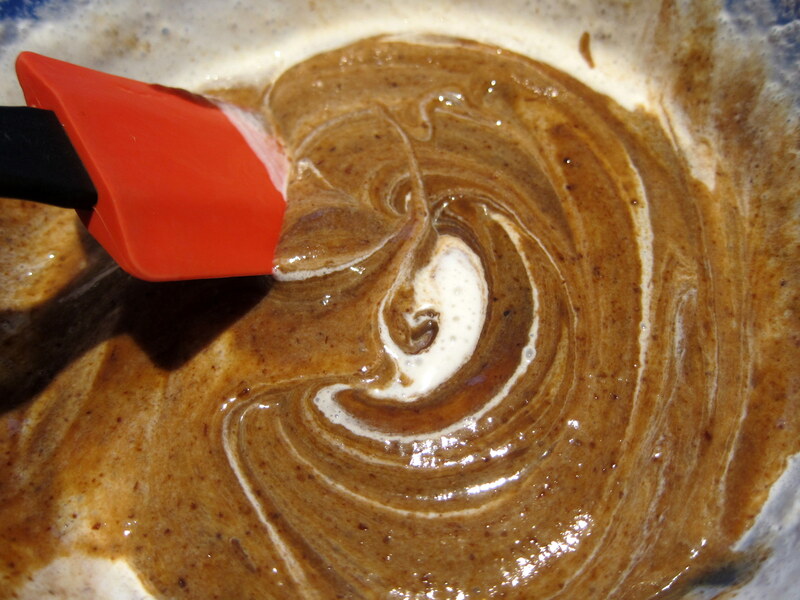 Fill water in a sauce pan, add the small amount of sugar and the required number of prunes. Bring it all to a boil, then simmer for about 10-15 minutes until the prunes have turned really soft. Take up the prunes but keep the ‘prune water’. The prunes may not look their best right now, but simmering them will ensure a great-tasting, smooth purée. And remember to keep the ‘prune water’ – it is also going to be added to the purée, and contribute to our frozen yoghurt base. If your prunes are to be pitted, do it once they are cool enough to handle. 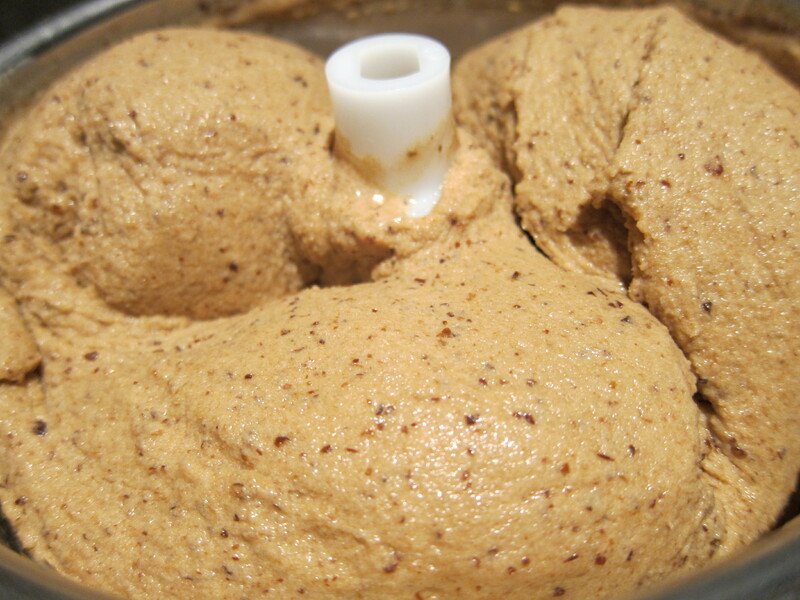 If your prunes already were pitted, process them briefly – preferably in a food processor – for about 10 seconds or so. Then add the ‘prune water’ and continue to churn it all until the prunes are completely puréed. Let the purée cool down (preferably also chill in your refrigerator, as per usual good practice of working with as cold as possible ingredients when actually freezing your ice cream). Blend the whipped cream, the yoghurt and the prune purée. Then churn in your ice cream machine until ready. Swirling it all together (lovely sight, is it not)? 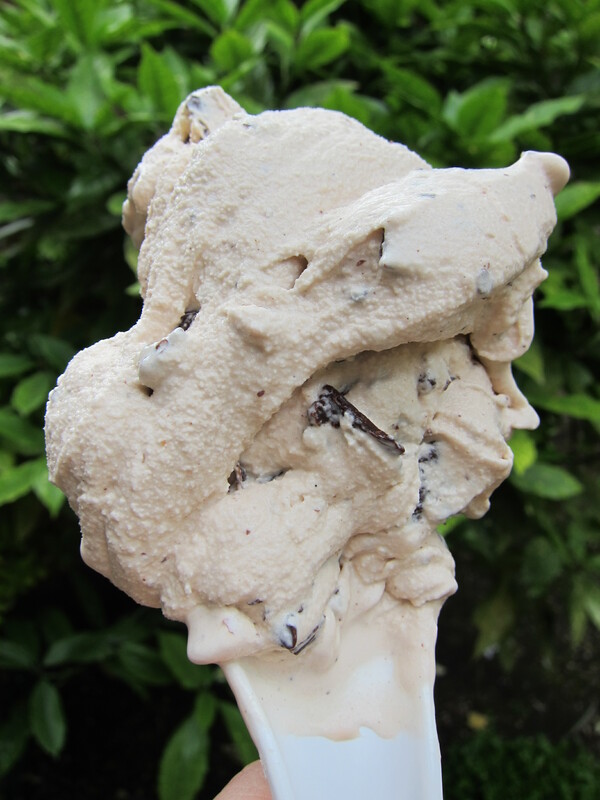 Mmm … just churned Prune frozen yoghurt: a real delight to consume fresh! No ice cream machine? – No problem: put the base in a freezer-safe container, put on a lid and still-freeze in your freezer (detailed instructions here). It can be difficult to create tasty frozen desserts that manage to remain fairly healthy – cut back on sugar, and the end-result does not turn out sweet enough, cut back on fat and the body of the ice cream and general consistency begin to suffer. But sometimes, it works out just fine (remember the lean chocolate sorbet?). And luckily, prunes and frozen yoghurt turns out to be a match made in heaven – both healthy and really delicious. Personally, I adored the flavour: rich and pruny but with a markedly subtle sweetness. Admittedly, if your taste buds have become too accustomed to high-sugar contents, you may possibly find the sweet, discreet charm of the prunes to be not quite sweet enough (which of course could be fixed, either by adding more sugar, or by concluding that you might benefit from less general sugar in your life, and then consequently aim to ‘re-adapt’ your sugar-spoilt taste buds). 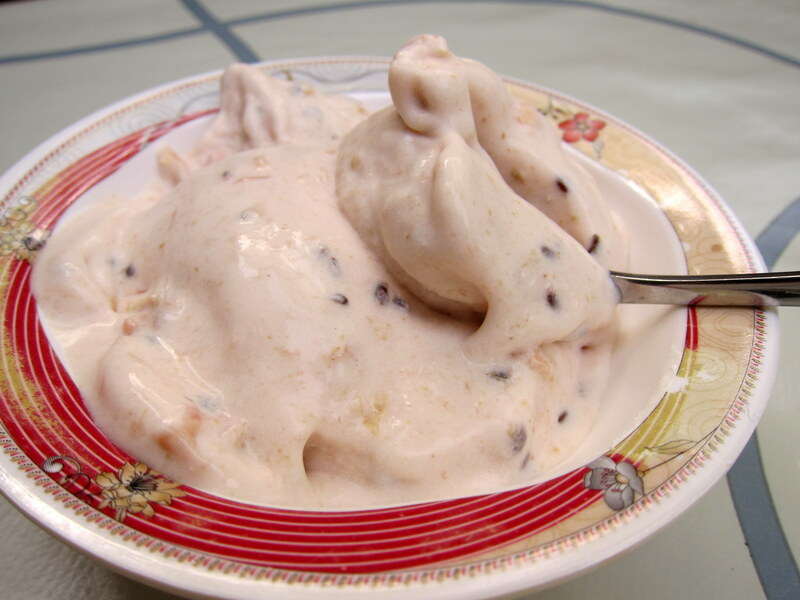 But before you decide to considerably ‘sweeten up’ the recipe, I should add that it is not only my discerning taste buds that have fallen for the Prune frozen yoghurt – my dear kids have turned out to really like it as well! 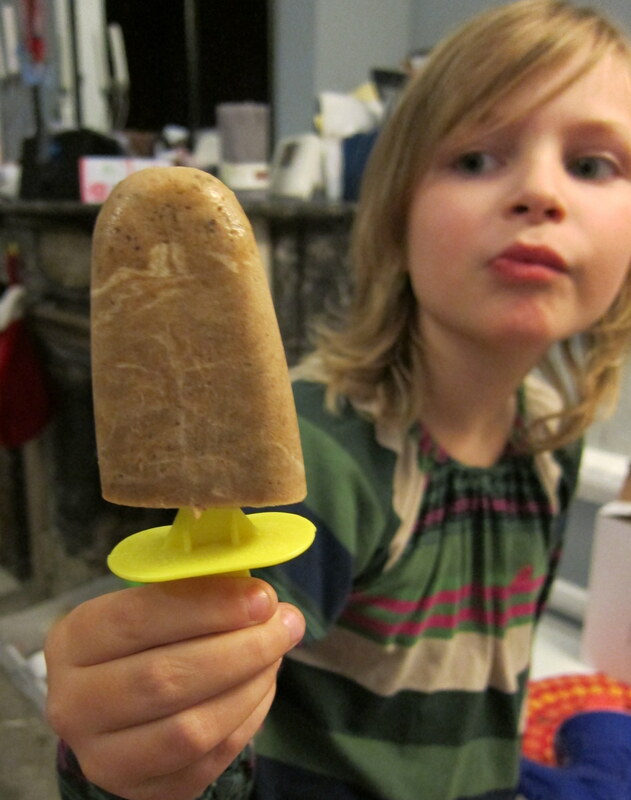 Prune frozen yoghurt – perfect also for ice popsicles! The prune frozen yoghurt is at its tastiest just fresh after the churning (or closely thereafter). But it can also be kept frozen in the freezer for future enjoyment. Just remember that it will freeze quite firmly, so set aside some time for the frozen yoghurt to soften up before serving. Or thaw in a micro-wave oven for about five to ten seconds or so (not great if you plan to re-freeze it, however, so I would only recommend micro-waving the portions about to be consumed). Adults may possibly want to add one or two tablespoons of brandy (Armagnac is a classic dessert-companion to prunes) to the purée – this will add some depth to the flavour of the prunes, and also improve the scoopability of the final frozen yoghurt by making it freeze less stiff. So, check your kitchen cupboards for a bag of prunes – in no time, you will have a most enjoyable frozen yoghurt, both healthy and really, delightfully delicious! This fresh-tasting frozen yoghurt, inspired and adapted after a prune gelato-recipe by Marcella Hazan, represents a lot of what's so good with frozen yoghurt! Put the prunes, sugar and the water in a saucepan and bring to a simmer on medium heat. Cover and cook until the prunes have become very soft (about 10-15 minutes, depending on size). If the prunes are to be pitted, let them first cool off in the liquid of the saucepan before pitting them (be sure to keep the liquid, by the way!). 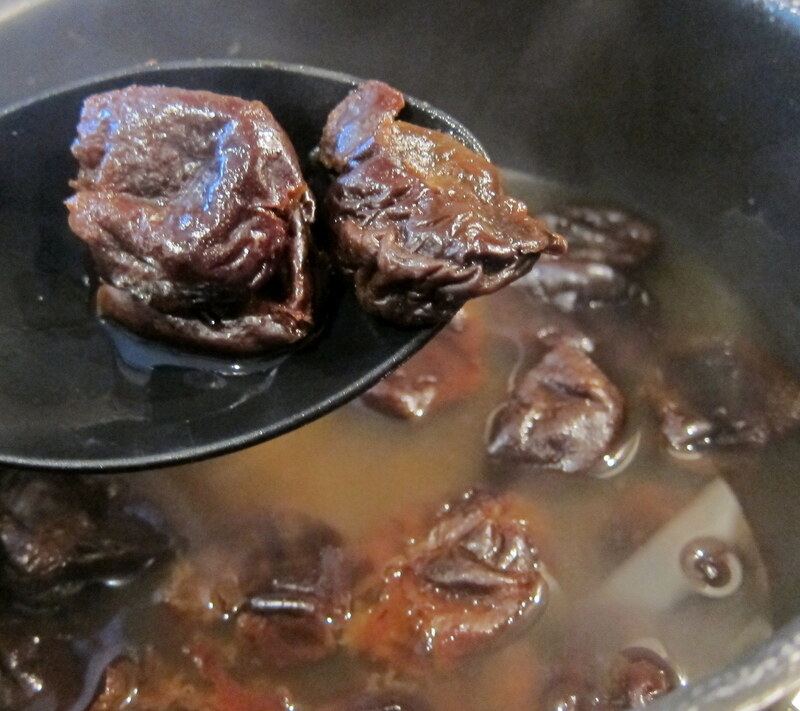 When cooled down - or If the prunes already were pitted - remove them from the liquid of the saucepan (keep the liquid! 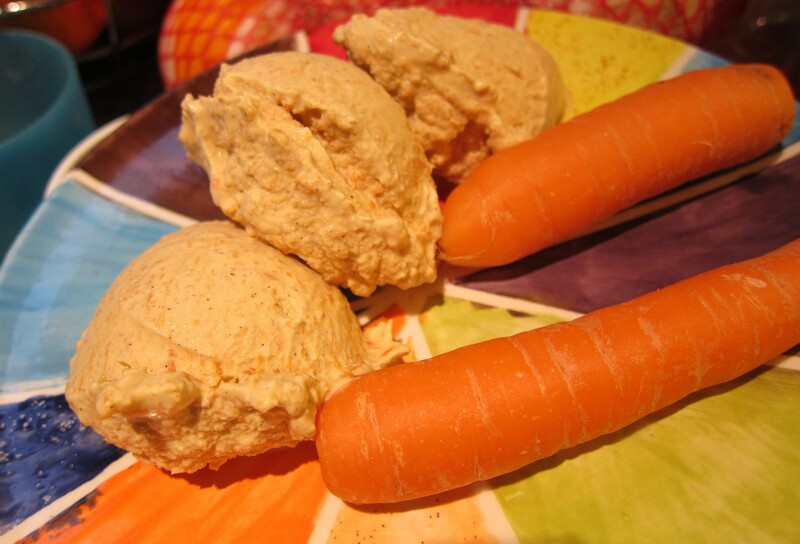 ), put them in a food processor or equivalent and run them for a couple of moments. Now, add the liquid from the saucepan and continue processing until the prunes are completely puréed (if using, add the brandy now). Whip the cream so it increases to about twice its volume. Blend the cream with the yoghurt and the puréed prunes. Churn in your ice cream machine according to instructions, or still-freeze in your freezer (further instructions in the post on making ice cream without ice cream machine!). Enjoy fresh or after a 1-2 hour spell in the freezer. If to be enjoyed later, store in a freezer-safe container, cover with plastic film and a lid and put in the freezer. If you consider that the final base is insufficiently sweet, you could add some more sugar according to taste. Consider adding 1-2 tablespoons of inverted sugar (like Agave nectar, corn-syrup or the likes) which will give more sweetness per volume than 'ordinary sugar'. Adding some alternative sweetener (like Stevia-products) might be another possibility to consider. Will try this recipe for an ice pop. I am having trouble with my hibiscus ginger ice pop.My commercial freezes is at -20 F, but the pop starts to melt while I package it. The ingredients are dried hibiscus flowers, sliced fresh ginger root, agave nectar, and lemon juice. I measure the carb content with a refractometer, that reads 17%. Do I need to add a stabilizer like gelatin or clear gel? This is the only pop I have this problem with. Well, if you consider the melting to be a problem, I guess you should try to do something about it 😉 . Before adding extra stabilisers (which, of course, is one possible way), I would perhaps suggest that you try tinkering with what you already have, so to say: You could for example see what happens if you make the ice pops a percent or so less sweet. But you could also stay with the percentage and experiment with using [more] ordinary white caster sugar instead of agave nectar (the latter counting as inverted sugar, and thus more prone to soften your frozen pops). Good luck with your hibiscus ginger ice pop now – it does sound really nice!